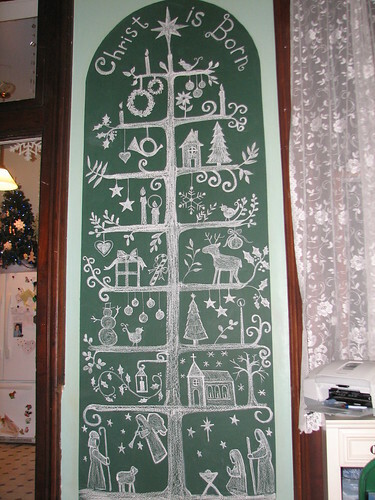 One Christmas project I failed to post about when it was finished last season was our chalkboard Christmas tree. 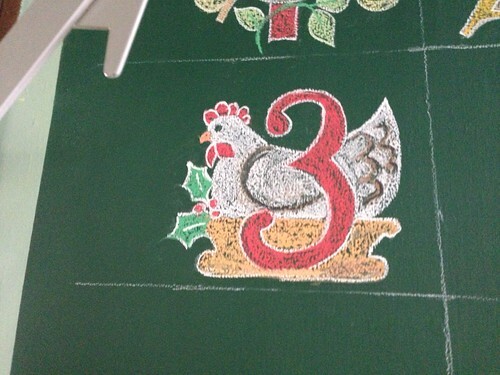 You may remember that we made our first chalkboard tree in 2012. It was a Scandanavian style tree, using the one pictured on the blog A Legg Up as a guide. That blogger found the tree on a decor website. Her inspiration was a wall hanging with the tree printed on fabric. It is no longer available on that site. This was our finished project. My sister Genny did the drawing. I made patterns and “gave advice.” Right, Genny? 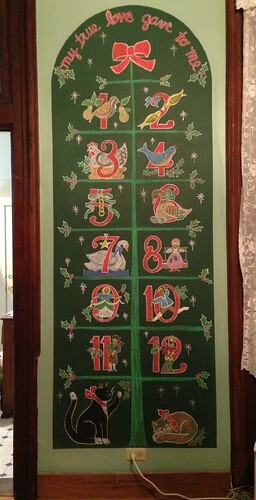 After some deliberation, I decided we would attempt the Twelve Days of Christmas for our 2013 chalkboard tree. I googled the theme and clicked IMAGES for inspiration. 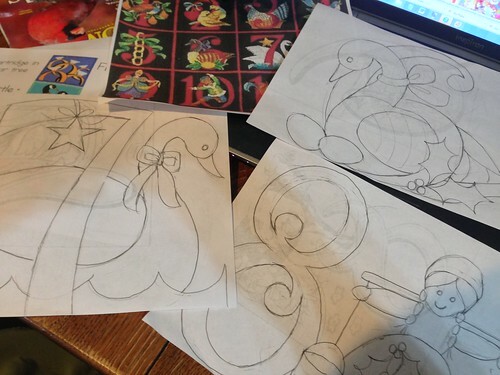 I chose the ones I liked and adapted patterns from them to fit the size that needed to be filled. Genny divided the tree into twelve spaces. 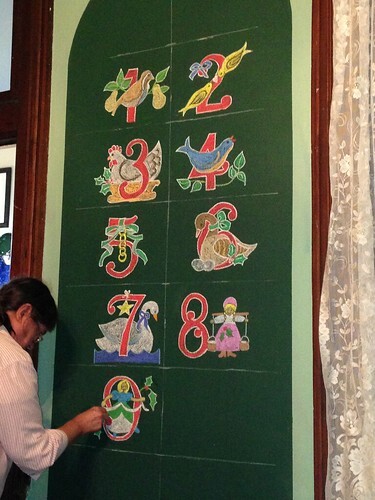 I chalked the back of each pattern with white chalk and Genny traced over the pattern to transfer it onto the chalkboard. Then she began the task of filling in the color. Using colored chalk was fun. It made a great contrast to the white chalk tree we had the year before. 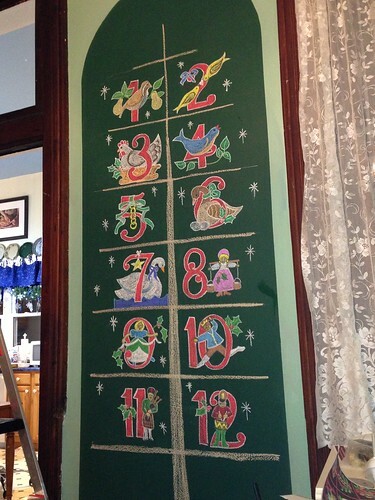 I can’t remember now, but for some reason we didn’t like the first rendition of the Two Turtle Doves. As you can see in this picture, we changed them a bit. They do show up better second time around. The design of the Five Golden Rings was changed, also. Much better in the second version. Almost done. Genny added twinkling stars to give some fill to the background. We also decided to change the color of the branches. The light orange in the previous picture didn’t seem right to me. The green was better. Genny added a bow to the top, holly to the ends of the branches and a quote over all. Two kitties were perfect under the tree. That’s Zak on the left and Cedar on the right. And, yes, when we count how many trees we put up for Christmas, we count this one, too. It takes more time to “decorate” than some of our other large trees do! This entry was written by ~~Rhonda, posted on July 30, 2014 at 5:01 pm, filed under Christmas. Bookmark the permalink. Follow any comments here with the RSS feed for this post. Post a comment or leave a trackback: Trackback URL. I loved the white chalk one but now that I see one that is colored, I think it is my favorite lol. The church I grew up in decorated their tree with sparkly cross-stitched Chrismon ornaments, and I always loved looking at them. I bet the twins would have fun learning what all the symbols mean. 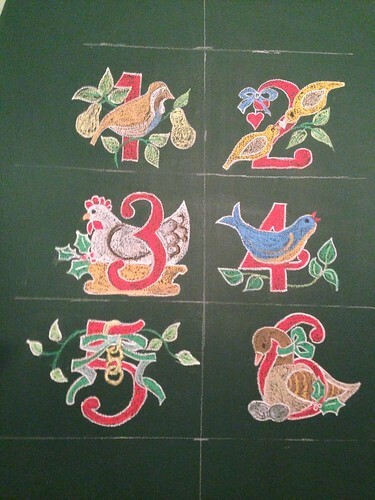 Both renditions of your chalk tree are wonderful Rhonda! A Chrismon tree would be fabulous too. All those symbols and meanings. The church I grew up in had a Chrismon tree. I remember my mom helping to make the ornaments out of beads, gold trim and styrofoam balls and shapes.